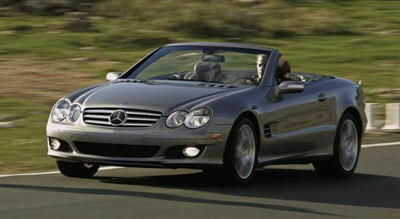 The Mercedes-Benz SL-Class of two-seat roadsters has been significantly upgraded for 2007. These were wonderful cars before, and they’re even more wonderful for 2007. For 2007, all SL models get revised styling, with new front, rear, and side sheetmetal along with new interior decor. The entry-level model, now called the SL550, gets a bigger, more powerful engine, and a new seven-speed automatic, giving it a big boost in performance and a sportier sound. The SL55 AMG gets more power as well. The steering and active suspension have been upgraded on all the 2007 models, sharpening the handling. At the same time, these cars provide grand touring intimacy, for quiet conversation or unimpeded stereo performance. New upholstery materials give the cabins a richer appearance. Drop the top and they deliver comfortable, top-down motoring, putting the wind in your hair, and whisking your troubles away. Buffeting is well controlled, so you don’t even have to put up with much wind. Few sports cars can boast a continuous 50-year history like the Mercedes-Benz SL can. First offered as a two-seat 300SL roadster in 1957, the SL-Class brought heart-stopping good looks, fuel injection, independent front and rear suspension and disc brakes to the sports car party, and has been in the Mercedes-Benz lineup ever since, leading the applied technology in the sports car segment with things like the disappearing steel top, radar, sonar, active hydraulic suspension and composite brakes. Today we have the safest, quickest, flattest-handling and prettiest SL-Class cars in half a century. The SL-Class comes in one body style, a two-seat roadster with a steel retractable hardtop. The SL550, SL600, SL55 AMG, and SL65 AMG deliver varying levels of performance, however, ranging from fast to faster. The SL models compete in the luxury sports car segment with the BMW 6 Series convertible, the new Jaguar XK, the Porsche 911 Turbo cabriolet, and the Aston Martin V-8 Vantage. The 2007 Mercedes-Benz SL-Class comes in five distinct flavors, starting with the most popular model, the SL550 ($94,800) with its new 382-hp 5.5-liter V8 engine and new seven-speed automatic. The SL600 ($132,000) features a 510-hp 5.5-liter V12 engine. Since this is the 50th anniversary of the SL, there will be a limited run of 550 50th Edition SL550s, all with brown leather interior, pewter paint, and black ash wood trim, a handful of special options made standard, special trim and matching 50th Edition luggage. The high-performance SL55 AMG ($128,800) features a supercharged 5.5-liter V8 and special tuning by AMG. The SL65 AMG ($186,000) is powered by a 6.0-liter twin-turbo V12, rated at 604 horsepower and a staggering 738 pound-feet of torque. Both AMG versions, in addition to their special front, rear, side, and interior trims, sport seats, and AMG alloy wheels, have a new dashboard information display that includes for the first time a RaceTimer feature that will track lap times, lap length, average speed, and top speed. The SL65 AMG gets an electric trunk closer, aluminum steering-wheel-mounted shift levers, a complete carbon fiber interior, and a center high-mount stop lamp in white instead of red. The safety package leaves nothing out. All SL-Class models comes with ABS with huge disc brakes, ESP electronic stability control, traction control, ABC automatic body control suspension, front and side air bags, and an automatic deployable rollover hoop behind the seats. Options include a comfort package, wood-and-leather trim package, AMG Sport package, hands-free communication package, bi-xenon headlamps, Distronic cruise control, Parktronic park assist, run-flat tires, the Keyless Go entry and starting system, and the Panorama roof option, all at about the same prices as the 2006 model. For 2007, the Mercedes SL-Class sports a more aggressively styled front air dam, a new front grille and chrome-trimmed fog lights. The SL550 (which will still be called the SL500 in most other markets) has the least body adornment within its bolder, sportier new design envelope. The designers have given the SL550 a much more aggressive front-end appearance, a new lower air dam, new front lamps, a bigger grille, and new sill plates inside the doors. The taillamps are new, with white rather than red lenses, as are the 18-inch 10-spoke alloy wheels (alternate 18- and 19-inch wheels and tires will be optional). The SL600 and SL65 AMG will carry front fender badges reading V12 Biturbo, while the SL55 will be badged V8 Kompressor. The two AMGs will share body panels, noses and sills, while the SL550 and SL600 share design details. All of them are absolutely gorgeous. The folding and disappearing power top raises or lowers in just 16 seconds. The designers have increased the level of luxury inside this already beautiful interior for 2007, by specifying more expensive leathers, woods and carpeting throughout. The main instrument cluster has been redesigned, with new chronometer graphics and additional leather stitching on the binnacle. New aluminum trim panels are coordinated with a new burr walnut wood trim. New, softer leather is used on the seats and panels, and new colors, black and red, have been added. Cockpit comfort in the SL550 as well as the other models is superior, with a huge range of seat and steering wheel adjustability, and the seats are supremely comfortable and containing. This is a two-seat sports car, however, and there's still that wall behind the seats that restricts seat travel and may make taller drivers fidget around, looking for the best compromise in seating comfort. All of the controls are in the same places as on the 2006 model, albeit surrounding by more aluminum trim, and they're easy to use, including the COMAND system and the navigation screen. With the steel top up, you have the kind of grand touring intimacy you want with your driving partner. In 16 seconds, you have the open-air cruising mode, and with the side windows up and the conversation panel flipped up behind the seats, you can converse with your partner in a normal voice, or listen cleanly to the stereo right up to about 100 mph when the wind noise will win out. Sirius Satellite Radio with six months of free service has been made standard equipment on all models. The in-car hands-free communication system can use either Bluetooth connectivity (to use with your Bluetooth-compatible cell phone) or a multi-handset interface, each of which is sold separately from the car through dealerships. An electric trunk lid opener button has been added for 2007. A power trunk lid closer will be added but won't be on early 2007 models. The luggage cover, which keeps luggage from interfering with the stowed top, is now removable, to add more luggage space in the tiny trunk. If you're planning on carrying more than a weekend's worth of luggage for two, though, you're out of space already. The SL offers 10.2 cubic feet of trunk space with the top up, 7.3 cubic feet with the top down. You can't argue with more horsepower, more torque and more gears to put them through. Not in this segment, you can't. The larger, more powerful V8 engine that comes in the 2007 Mercedes SL550 rips through the gears in the new seven-speed automatic at a furious rate, if you want it to. When you prefer to cruise, it just sits back and relaxes, upshifting and downshifting silently. The new V8's exhaust system has been re-engineered to give a much more throaty, sporty sound at wide-open throttle. It settles into a nice burble at cruising speeds. While most German cars are limited to 155 mph by an industry agreement, how quickly you get there is another matter entirely, and the SL550's V8 will get you from rest to 60 mph much quicker, in about 5.5 seconds. Every chance we got, we mashed the throttle pedal down into the carpet at stop signs and traffic signals, and the electronic systems allowed about two turns of the tires before taking over control and keeping the car pointed straight ahead, every time, like launching a rocket. Very confidence-inspiring. In terms of steering and handling, the 2007 SL has even more chops. The steering ratio has been quickened up so that left-right transitions happen more quickly, there is more feel in the system at the steering wheel, and it tracks better. The second-generation Automatic Body Control (ABC) active suspension system, now standard equipment, has been altered radically, so that it controls body roll, pitch, dive and yaw about 60 percent tighter than the original system, and makes fast driving on challenging roads a very rewarding experience, without beating up the two occupants with a rough ride. We've also driven the silky smooth S600 with a 510-hp V12 that packs 612 pound-feet of trip-shortening torque as well as the SL55 AMG with a V8 also rated at 510 horsepower, but with a mere 531 pound-feet of torque. Which model? The SL600 is the one we would buy if we could afford it and justify its price. Its quiet, smooth demeanor, the refinement of the ride, along with its incredible performance (0-60 in the low 4-second zone) and brilliant handling make it the ultimate of luxury sports car. Its turbocharged 5.5-liter V12 engine boasts 510 horsepower and 612 pound-feet of torque. It's paired with the heavy-duty five-speed automatic to handle the huge torque output of the engine. The SL55 AMG, with supercharged power, lightning shifts with or without the manual shifter paddles, completely different ABC suspension calibrations, bigger, more powerful brakes, and huge tires, is rougher-riding than either the 550 or the 600, with 0-60 times of about 4.5 seconds, louder at the exhaust tips, but oh, so much fun to drive, so much more masculine looking, and more agile than the other two versions on a country two-lane road. The supercharged 5.5-liter V8 engine gets more power for 2007, to 510 horsepower and 531 pound-feet of torque. The SL65 AMG is the quickest SL of them all, accelerating from 0 to 60 mph in just over four seconds flat. It uses the 6.0-liter twin-turbo V-12 engine, rated at 604 horsepower and a staggering 738 pound-feet of torque. Regrettably, we have not driven the new SL65 AMG. The sensible SL to buy, if buying an SL can be sensible, is the SL550. It delivers plenty of performance. Its new 5.5-liter double-overhead-cam, 32-valve V8 engine delivers 382 horsepower and 391 pound-feet of torque. That's 80 additional horsepower and 52 foot-pounds more performance than the previous SL500, a car that was already quick. And the more expensive, more powerful models don't get the SL550's new seven-speed automatic. All the versions we drove had enormous acceleration, but they also had huge brakes with ABS, EBD, ESP and traction control, enough braking power to pull down small buildings with a single stomp, with excellent pedal modulation and linearity. Over the years, we have driven every version of the SL including restored 1957 models, the square-topped Pagoda models of the Sixties, the fixed-roof and removable roof 450 SLs of the Seventies, and down through the rest of the line, and enjoyed every one. These are beautiful, beautifully made, stately luxury sports cars made in small volumes for customers who tend to be repeat buyers. Today, we have the safest, quickest, flattest-handling and prettiest SLs in half a century, and MBUSA is trying hard to keep the lid on the luxurious prices. New Car Test Drive contributor Jim McCraw filed this report from Palma, Majorca, Spain. Head/hip/leg room, f: 37.7/54.0/42.9 in. Cargo volume: 10.2 cu. ft.